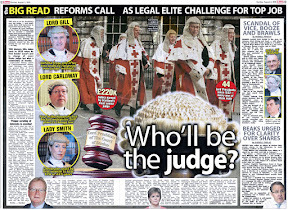 On Monday of this week, the Scotsman held a live legal 'debate' on the future of the legal profession and the Scottish legal services market.The 'debate', which opens the nominations for the legal awards 2009, where you might even be able to nominate Scotland’s most crooked lawyer, was intended as a “Have Your Say” on the state of the legal profession. 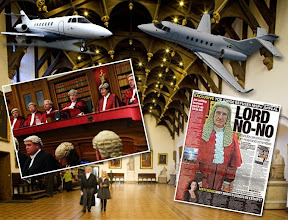 Sadly however, spectators and guests alike coming out of the meeting claimed the 'debate' such as it was, did nothing to address the public's continued scepticism over attempts by the Scottish Government and the legal profession itself to reform the way in which solicitors are regulated in Scotland. 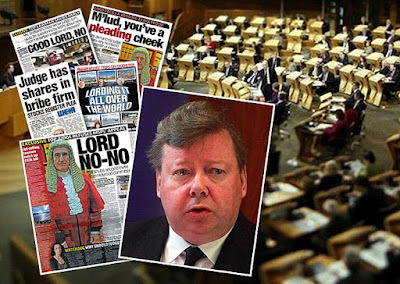 The tone of the debate, as one solicitor himself put it seemed to be that of a self congratulatory pat on the back, for avoiding the creation of a completely independent regulator which may have ended up exposing the vast amount of corruption in complaints & the poor handling of client affairs which many associate with the Scots legal profession. 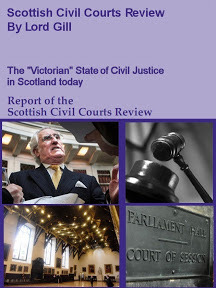 However, consumers & clients, concerned over the lack of progress in reforming the legal profession, and access to justice in Scotland, cited examples such as the huge numbers of client complaints and continuing almost daily scandals portraying many of Scotland's legal firms to be either crooked or incompetent at their job, coupled with the Law Society’s inability to raise standards of service in what is now recognised as one of the worst quality legal services markets in the developed world, as being issues which to the panel members present at the ‘debate’, seemed unwilling to address. One bright point of the night was a question from the floor to Jane Irvine, the Chairman of the 'independent' Scottish Legal Complaints Commission on why during her time as Scottish Legal Services Ombudsman, she had done little over the Law Society of Scotland allowing solicitors to shred and destroy files before & during an investigation, in a practice which surely borders on the criminal. 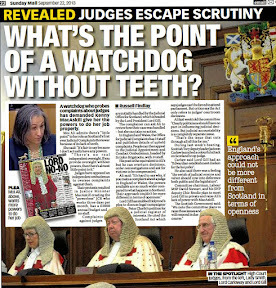 The apparently acceptable practice of solicitors destroying files before & during Law Society investigations was compared to the recent example of the Conrad Black case where it was alleged there had been mass destruction of files, inevitably leading to Blacks’ guilty verdict and jail term, and Jane Irvine was asked what steps she had taken to deal with the matter. 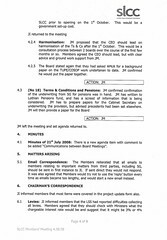 Unsurprisingly, Mrs Irvine was “left speechless” as one onlooker put it ... as it has emerged there has been nothing done since the issue was mentioned in her annual report of 2006-2007, covered here and there has not even been a report made to the Police & Crown Office, despite a ‘memorandum of understanding’ which states that all criminal activities must be reported to the authorities. 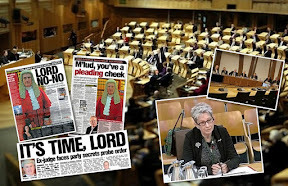 While the 'debate' dragged on with questions coming mostly from the Chair rather than the floor, notable lack of mentions included a decision by the SLCC to engage with the notorious insurers Marsh UK on presentations to the Commission over the workings of the corrupt Master Insurance Policy which insures Scottish solicitors against negligence & financial damages claims from clients. Also failing in a mention at the 'debate' was the SLCC's Chief Executive, Eileen Masterman (pictured from a Which? 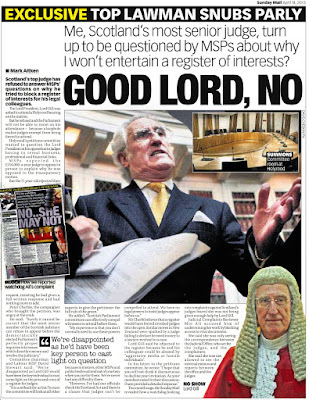 article) refusal so far to allow potentially hundreds of client victims of the Law Society’s ‘Master Policy’ to make an equivalent presentation to the Commission on their appalling experiences with access to justice and the insurance claims process against crooked lawyers. 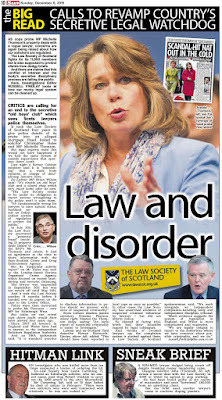 It may do Mrs Masterman some good to note and reflect on the fact it was the same terrible experiences experiences of clients and the public with the Law Society of Scotland and the Master Policy, which the current Cabinet Secretary for Finance, John Swinney aired at the Justice 2 Committee hearings into the passage of the legislation, which created the Commission and gave Mrs Masterman her current job & salary. One guest at the debate who left with a feeling it didn’t go the way the Law Society figures present wanted, made the following comment: ”The Vice President of the Society (Ian Smart) was positively boiling with rage - he kept it disguised, but he knew that the wee public relations event was a shambles, akin to a puppets convention"
Another guest who attended was highly critical of the SLCC, and unimpressed with the Scottish Government’s efforts to give the public a measure of fair & independent regulation of the legal profession. 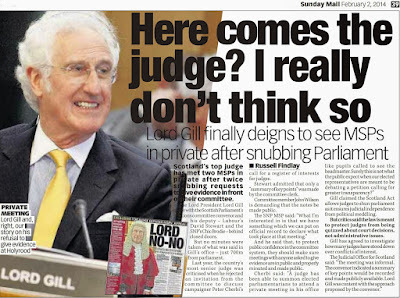 He spoke out against Jane Irvine’s input into the debate : "Irvine, the SLCC Chairman appeared a complete non-entity. She spoke with sufficient 'expression' that just about belied the emptiness of content in her words which sounded like a script she'd been given to read out to a room full of lawyers who all know the game is all about protecting their backs after they are caught out fleecing their clients." 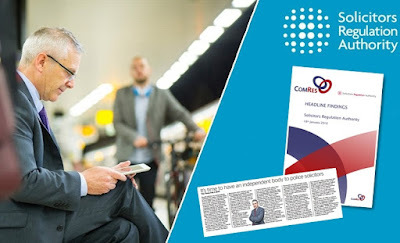 Sadly however, Mr Evans indicated ‘he preferred to look forward, as looking backwards would not assist progress to making the future better’, so clearing up the sins of the past doesn't seem to be on the minds of Consumer Focus Scotland for now. Consumer Focus Scotland were contacted for a comment on the debate – they refused. 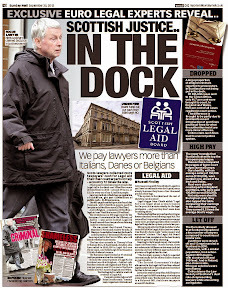 Perhaps, as one experienced journalist put it who also failed to get a comment out of the Consumer Focus camp - "They have been told not to rock the boat or support any moves to recompense or reconsider past cases of complaints against solicitors, due to the sheer volume and corruption which has taken place over the years at the Law Society of Scotland". 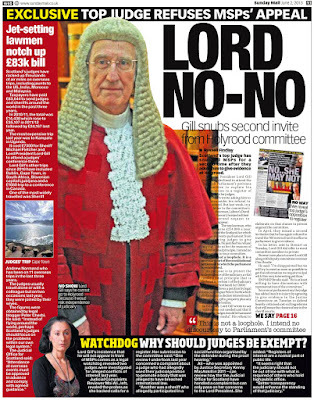 So at the end of the day, the ‘debate’, such as it was, didn’t really do much to give anyone hope the future of Scotland’s legal profession and legal services market would be any better than it is now .. and that is simply not good enough. EVEN if it was possible to forget about the recession, there has been no shortage of challenges facing lawyers and those who depend upon their services. 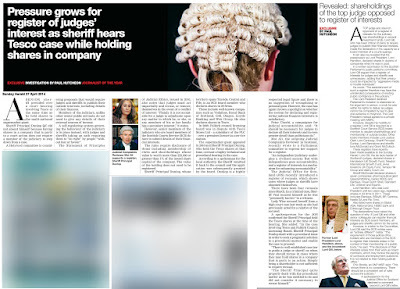 Tonight, Scotsman readers will have a rare opportunity to ask a panel comprising some of the key figures in the profession – and those tasked with keeping a close eye on what it is getting up to – what the future holds both for solicitors and their clients. As I am chairing the debate, I have been reflecting on some of the big issues that are likely to come up. From the point of view of consumers (and that includes me), one of the biggest is likely to be just how is the new complaints landscape shaping up? 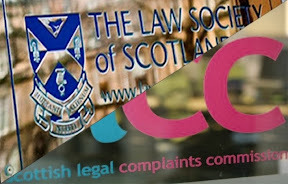 Following widespread and ultimately insurmountable public cynicism about the Law Society’s ability to carry out impartial investigations into complaints about its own members, the new Scottish Legal Complaints Commission opened for business just over a month ago. Commission chair Jane Irvine will be on hand to give a progress report on how the complaints gateway has fared during its first weeks in operation and to answer queries as to what the new rules and regulations will mean in practice for lawyers and consumers. Joining her on the panel will be Ian Smart, vice-president of the Law Society, who will be able to give his perspective as a practising solicitor – and may want to take the opportunity to point out that there has been a downward trend in complaints in recent years. Nevertheless, the audience might well want to know what the society is doing to drive up standards in the profession – a project that is due to come to fruition next year – and to prevent service complaints from cropping up in the first place. With the recession kicking in, law firms have their part to play in growing Scotland’s economy, so perhaps the most pressing issue that the Law Society and firms now want some clarity about is what the advent of alternative business structures will mean for the future. Following last year’s Which? supercomplaint to the Office of Fair Trading, solicitors are now awaiting the Scottish Government’s proposals for ABS, which could allow non-lawyers to be partners or investors in firms. Panel member Martyn Evans, director of Consumer Focus Scotland, will be well-placed to set out the arguments in favour of deregulation to increase choice and drive down prices for clients. Morton Fraser chief executive and CBI Scotland vice-chair Linda Urquhart will bring her unique perspective on ABS and other issues to the panel. Just what does the Scottish Government need to do in order to support firms competing in the UK and around the world? Solicitor advocate John Scott, a partner with Capital Defence and a high-profile campaigner on human rights, will doubtless have much to say on the potential impact of ABS on access to justice. 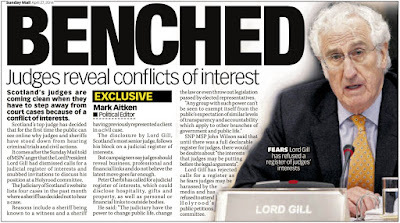 Legal aid funding, and the impact of recent changes to summary legal aid are also likely to be high up on his agenda. Amid all the economic doom and gloom, there is also the question of who will provide legal services in the future – is the profession doing enough to nurture talent, or has the LLB been devalued by the increase in students graduating from Scottish law schools? Will the Law Society’s proposals to shake-up education and training really serve to improve the diversity of the profession? And, crucially for recent diploma graduates, will a more robust traineeship only make it less attractive for firms to take on aspiring solicitors? While tonight’s event is designed to shine a bright light on what could and should be improved in the Scottish legal profession, it should not be forgotten that there is also much to celebrate. 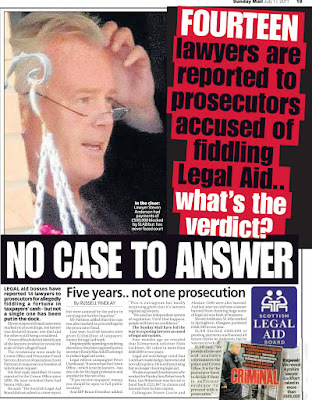 The debate marks the official launch of the 2009 Legal Awards to be held in Edinburgh next March. Entries are open now – who would you nominate? The growing public lack of access to legal services and choice of legal representatives has come into sharp focus at the Scottish Parliament this week, as the Petitions Committee considered Petition PE1197 from Mr William Alexander of the Association of Commercial Attorneys, asking the Scottish Parliament "to urge the Scottish Government to reform the legal system to adopt the Scandinavian system of allowing unrestricted access to legal representation before the court for example by allowing non-lawyers to appear in court on behalf of other parties." 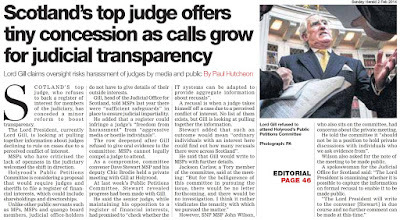 The Petitions Committee agreed to seek responses on the issues raised in the petition from the Scottish Government, Faculty of Advocates, Law Society of Scotland, Scottish Law Commission and the Scottish Legal Complaints Commission. 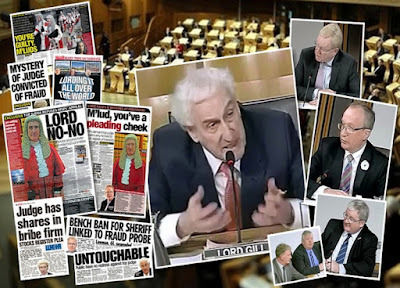 However, members of the Committee did not feel moved to ask the public for their own submissions on how difficult it has been to secure access to legal services and the Scottish Courts system, for fear it seems of receiving detailed and harrowing accounts of how members of the public themselves have been prevented from securing access to justice in Scotland. 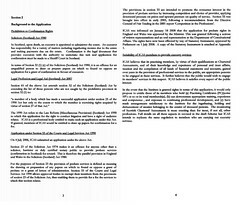 During the short four minute presentation of Petition PE1197, Bill Butler MSP (Labour) suggested there were specific points that responses should be sought on whether a precedent on widening rights of audience had been set after the the Scottish Government had granted rights of audience (albeit restricted rights of audience) to the Association of Commercial Attorneys giving a right to conduct litigation and secondly whether there are plans to expand those rights of audience to other groups and whether such changes are desirable ... and what impact there would be on the legal system in the light of such changes. 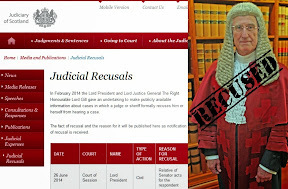 However, spectators to the debate were troubled by Nigel Don MSP who seemed to drift off in an interpretation of Petition PE1197 as being that of a request to allow anyone to represent themselves in the Courts, which of course, is not what is being asked via the petition. 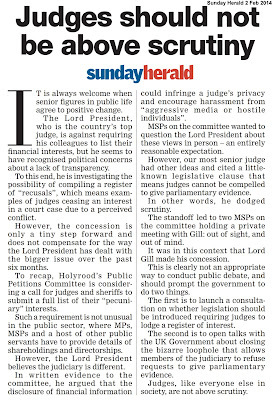 One spectator to the debate said "Mr Don seems to have got the wrong end of the stick which is worrying as he is a member of the Justice Committee, and I would have thought his experience in legal issues and the fact he is the Parliamentary Liaison Officer to Justice Secretary Kenny MacAskill would have ensured he picked up on exactly what the petition was about which is widening rights of access to audience & representation for non lawyer professionals to represent members of the public, rather than what Mr Don claimed which was people being able to represent themselves in court"
A source close to the Petitions Committee claimed “the Law Society may try to undermine the petition at a later stage because they (the Law Society) wouldn’t be happy others were attempting to encroach on solicitors business”. 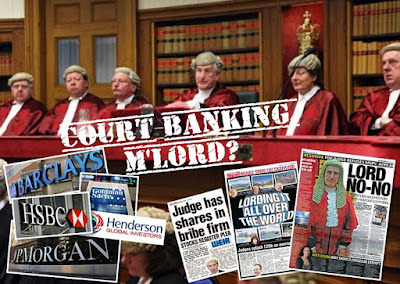 We must expect a degree of obstruction from the legal profession to the public’s wishes of wider access to justice as solicitors and the legal establishment have been far too used to holding a monopoly over legal services in Scotland for hundreds of years, a monopoly which has brought billions of pounds of profits to Scotland’s legal firms that many solicitors wish to keep for themselves in what is currently a very anti competitive, protectionist Scottish legal services market. 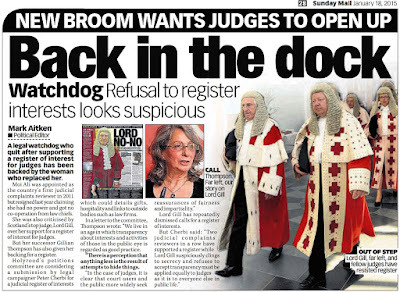 Opening up access to justice in Scotland, by granting rights of audience to non lawyer qualified professionals who are independently and effectively regulated would go a significant way to addressing the problems of many across the country who have been denied access to justice by a legal system which currently allows the legal profession to effectively chose the clients and cases it wishes to represent, and at costs to clients, which the legal profession currently determine itself. 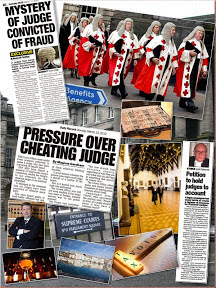 Clearly there is a genuine public interest in the progress of Petition PE1197, where many individuals in Scotland, and indeed, whole groups of people have found their access to justice hindered or prevented by the likes of the Law Society of Scotland and other industry groups & regulators who don’t wish to see certain kinds of cases or individuals gain access to legal representation or Scotland’s Courts. 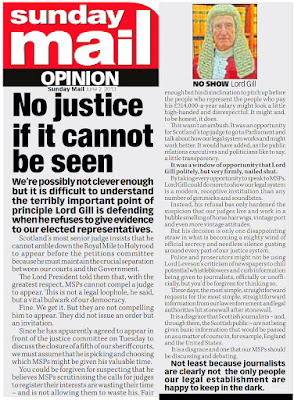 I therefore urge anyone who feels their access to justice or access to legal services have been restricted or denied, to make a submission to the Scottish Parliament on their experiences. Hot on the heels of the Commercial Attorney's application to represent members of the public in the legal services market, which I reported on late last week, the Institute of Chartered Accountants of Scotland have jumped on the bandwagon and have submitted a similar application to the Scottish Government demanding their ‘Chartered Accountants’ be allowed to handle legal affairs for clients such as wills & probate services. 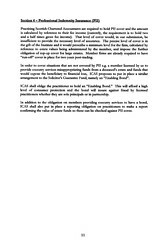 ICAS application demands accountants be allowed to handle wills & probate services while concealing dangerous lack of consumer protection : "ICAS believes that its practising members, by virtue of their qualifications as Chartered Accountants, and of their knowledge and experience of personal and trust affairs, taxation and the compilation of all kinds of financial statements and accounts, gained over years in the provision of professional services to the public, are appropriate persons to be engaged in these services. It further believes that the public would wish to engage its members' services in this respect. 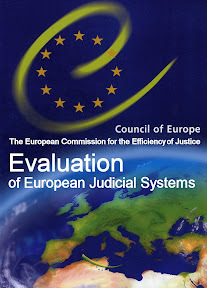 ICAS believes it satisfies every aspect of the public interest." 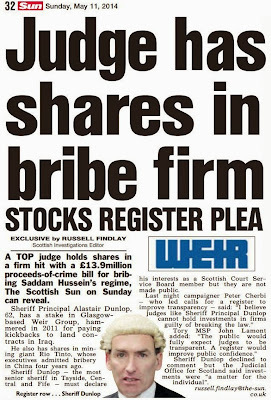 While increased competition in the legal services market is of course welcomed by most consumers but perhaps not solicitors, the fact is that Scottish Accountants lack safeguards to protect clients & consumers when their work becomes poor, or is sufficiently 'crooked' to the extent that client funds disappear, are embezzled, or lost on notorious financial scams created by the accountants which are so complicated they can never be resolved. 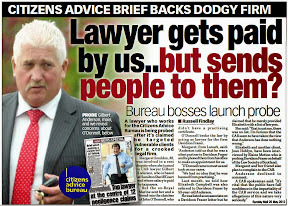 Moreover, when a client discovers they have been robbed by their accountant, they often find themselves bullied out of any legal representation they can obtain simply because the accountants firm is too powerful and linked to many local legal firms businesswise, making it 'not in the interest' of anyone to legally represent clients ruined by Chartered Accountants and proceed cases to sue crooked accountants and their regulator for recovery of lost funds. 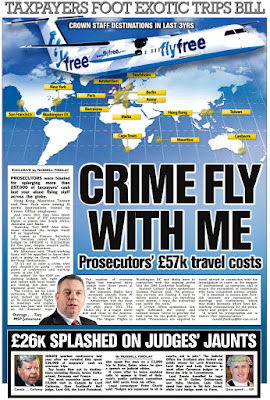 One area where such financial scams against clients are easy to get away with, relate to wills & probate services of deceased loved ones, where it is almost impossible to recover the many millions of pounds each year stolen by accountants and solicitors from the estates of dead family members, who willed their possessions & assets to their loved ones but more often end up in the back pockets of the accountants and solicitors dealing with their affairs post death. a. petitions to a Sheriff Court for appointment of executor's dative in intestate estate; (and some testate estates); b. applications to a Sheriff Court to resolve informalities in the execution of certain Wills; c. applications to a Sheriff Court to resolve queries regarding the domicile of the deceased; d. applications to the Court of Session where an original will has been lost but there is an extant copy; e. written applications to a Sheriff Court to present the inventory (of the deceased's estate), which is the basis for which confirmation will be granted. While the work above will be self-egulated by ICAS - that is, accountants will regulate any complaints against accountants carrying out the work, there will be no external safeguards for clients such as a measure of ‘independent’ regulation and oversight by the new Scottish Legal Complaints Commission, who will regulate the same work only if it is carried out by your solicitor. Despite ICAS claims to the contrary, there were no safeguards for my late father's assets .. Norman Howitt and the solicitor, Andrew Penman, of Stormonth Darling Solicitors, Kelso, simply pulled the estate apart for themselves, and not content with doing that, Norman Howitt then made a grab for the assets of my mother too, insisting she turn over all her money to him for his own control, losing my mother in a malaise of complicated legal documents she lacked any impartial legal consultation to protect from a very wicked attempt to rob her of her money. 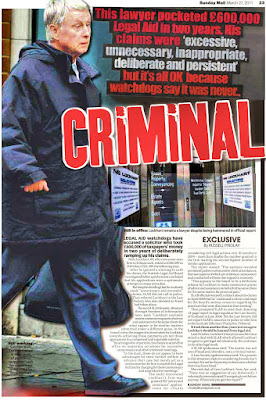 Indeed, such were the lack of 'safeguards' on Mr Howitt's activity, when it was discovered he had embezzled money from the sale of assets of my late father into his former accountancy firm's accounts (Welch & Co, Hawick), he fabricated claims to the Police to try and put myself and my legal agents off the scent of his trail of embezzlement ... and as you can see from the 'investigation' carried out by the ICAS Chief of Regulation - Dr Tom McMorrow, who is now the ICAS General Council, Howitt's illegitimate use of the Police to conceal his trail of theft and brutality against my family was kept out of the investigation and report for fear of attracting the possibility of criminal charges against Howitt for his actions. 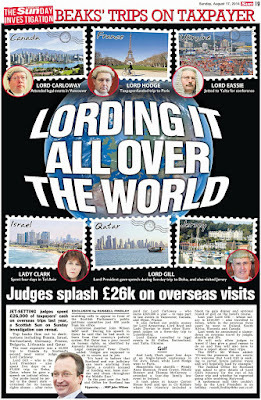 That is of course, but one case where an accountant deliberately and brutally set out to destroy a family solely for the purpose of gathering the money for his own control - that much is certain from the trail of documents which were leaked to me by solicitors running for cover at the extent of the scandal ... however, the trail of documents also show that Mr Howitt employed others to ensure he got his way, even to the extent of seeing they received huge sums of money free of charge just to ensure his own control over my late mother & father's assets ... a terrible situation which has been repeated many times over the years by accountants who have ruined the affairs of deceased clients for their own personal profit. 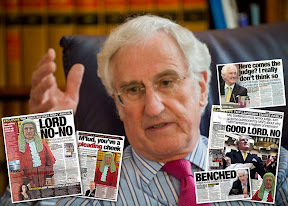 You may ask, what steps did I take to recover damages from what Mr Howitt did to my family ? Well I took every step I could, but Mr Howitt and his accountancy firm, and even ICAS themselves, ensured I could not obtain legal representation to do anything about it. 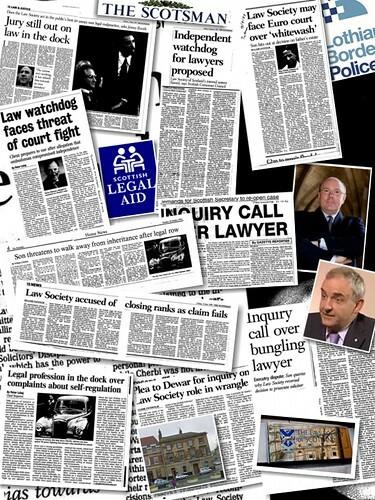 All the local legal firms were bullied into not representing me, because Mr Howitt's accountancy firm does business with all of the local solicitors ... and ICAS and the Law Society of Scotland saw to it I could not obtain any other legal agents from anywhere else in Scotland to handle the case, because of course, there were several firms of crooked solicitors also involved with Norman Howitt's mission to destroy my family's assets. ICAS claim within their application that Chartered Accountants are required to hold Professional Indemnity Insurance to cover any losses arising from negligence or other losses generated by their poor work for clients. 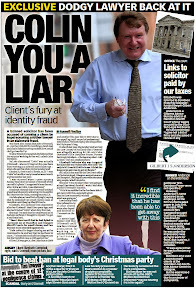 Well as it happens, when clients who have been ruined by crooked accountants ask for details of the indemnity insurance cover, they are kept in the dark, and ICAS themselves wont even disclose it, as I found myself when trying to pursue Mr Howitt for the huge financial harm he did my family - so this insurance cover which accountants hold to cover clients who lose out financially, is simply a pack of lies, a corrupt policy of protection for crooked accountants, similar to the same Professional Indemnity Insurance arrangements which have allowed so many crooked lawyers to escape without paying their ruined victims a penny. 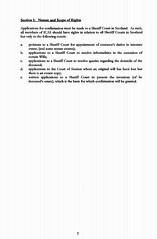 It comes down to this - As you can see from the ICAS application, Scottish accountants want the power to 'Norman Howitt' your money & assets after your death by raising an application to the Scottish Government for permission to handle your wills and other related legal business which currently, they cant do. Would you want what you own, what you have, what your family has worked for to be “Norman Howitted” away in a despicable series of events your family could possibly never recover from while trying to cope with your death ? From my experience, I say that allowing the ICAS application is too dangerous and not in the public interest at this time. There are inadequate regulatory safeguards over accountants who are still self regulated by their own colleagues, there is a severe lack of consumer protection offered against poor service (despite claims to the contrary) and to be honest, although I am loathed to say it, you are better taking your will and any such related legal business to a solicitor (or a qualified individual who is independently regulated), now that there is at least the Scottish Legal Complaints Commission to carry out ‘independent oversight’ of what is going on. Don’t believe the claims of ICAS, which is nothing more than a self regulating body which has no wish to compensate for the harm its members cause others. 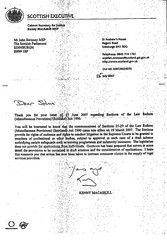 Justice Secretary Kenny MacAskill will announce in the next week or so that Bill Alexander, Chairman of the Association of Commercial Attorneys, has finally been given rights of audience & representation in Scotland’s courts, the first time ever in Scotland, a non-lawyer (someone who is not a member of the Law Society of Scotland) has been able to break into solicitors monopoly over legal services. 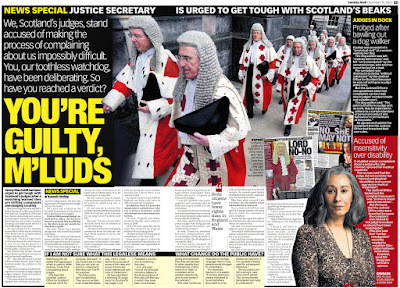 However, the expectations of a significant improvement of diversity in the public's ability to choose their legal representatives have been tempered by apparent protests and intervention from the legal establishment who are concerned about losing their long held monopoly over Scotland's multi billion pound legal services market. 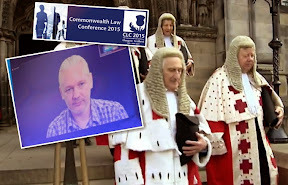 Mr Alexander, who has fought a long campaign over some twelve years to gain rights of audience and widen the public's choice of legal representation will face severe restrictions on what areas of law he will be able to practice, and today, an unnamed source at the Scottish Government claimed that Mr Alexander's practicing certificate such as it is currently being worded, will only allow him to practice Construction Law - a very limiting field of representation which wont do much to widen access to justice in Scotland. Secretary Kenny MacAskill said today : "Sections 25-29 of the Law Reform (Miscellaneous Provisions) (Scotland) Act 1990 came into force in March 2007. 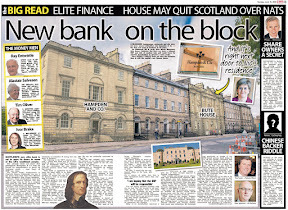 Since then there have been two applications, one by the Association of Commercial Attorneys and one by the Institute of Chartered Accountants of Scotland." 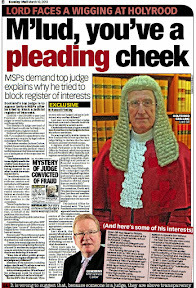 Mr MacAskill refused to comment immediately on questions put to him as to why it had taken several successive Scottish administrations a total of some seventeen years to implement the groundbreaking Sections 25-29 and particularly why a serving Lord Advocate, Lord Hardie in June 1997 intervened in the issue and apparently urged the repeal of the access to justice legislation which had originally formed part of the Law Reform (Miscellaneous Provisions) (Scotland) Act 1990. 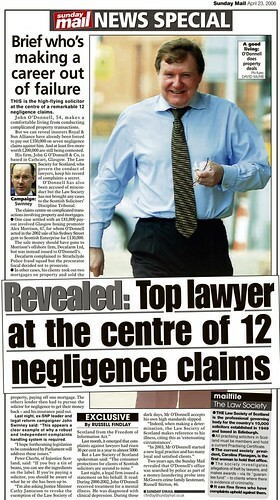 Mr MacAskill admitted there were severe restrictions being placed on the Commercial Attorney's application in a take it or leave it deal : "The Lord President and the Scottish Ministers considered that the draft scheme submitted by the Association of Commercial Attorneys met the requirements of the Act and the guidance subject to a few conditions. The Association has accepted those conditions and discussions are taking place to finalise the draft scheme." Kenny MacAskill to John Swinney : "You will be interested to know that the commencement of Sections 25-29 of the Law Reform (Miscellaneous Provisions) (Scotland) Act 1990 came in to effect on 19 March 2007. The Sections provide for rights of audience and rights to conduct litigation in the Supreme Courts to be granted to members of professional or other bodies, subject to approval in each case of a draft scheme embodying certain safeguards such as training programmes, and indemnity insurance. The legislation does not provide for applications from individuals. Guidance has been prepared that covers in some detail the provisions to be contained in draft schemes and the consideration of applications. I hope this reassures you that action has now been taken to increase consumer choice in the supply of legal service providers." 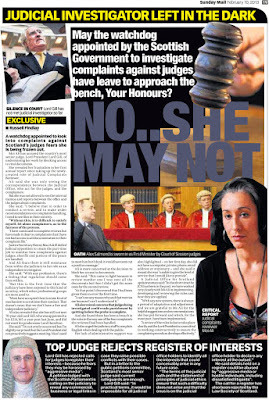 Final questions were put to the Justice Secretary on whether the Scottish Government will now make up to individuals for the lost opportunities of access to justice, which have in the words of some severely affected the lives of those who have tried to find legal representation outside membership of the Law Society of Scotland during the time that Sections 25-29 were held off the legislative books, however an eerie silence descended on the normally frank Justice Secretary as I suppose Mr MacAskill does not wish to admit culpability where culpability does seem to exist, given it was the Government which clearly held the legislation from public use. In relation to the second application, coming from the Institute of Chartered Accountants of Scotland, a Scottish Government spokesman would only say : "The application by the Institute of Chartered Accountants is still under consideration." - however, if you wish to read what accountants can do to clients affairs, particularly a deceased client's estate, read this. I for one, would warn against approving the ICAS application under Sections 26-29 as ICAS’ style of self regulation against crooked accountants is generally as bad as, or possibly worse than the Law Society of Scotland. So we are left with an impression yet again, the Scottish Government is taking one step forward and four steps backwards in the policy area of promising to widening the public’s access to justice, by on one hand, allowing rights of audience applications to be made by individuals or organisations, then heavily restricting which areas of law can actually be practised in a ‘gun to the head’ style response, thus largely maintaining the present solicitors monopoly over legal services & access to justice in Scotland. 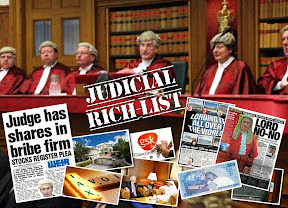 It seems quite apparent that once again, the legal establishment, who are solely interested in maintaining their long held monopoly over legal services in Scotland, are the driving force on what will happen next, rather what should be the case of the public interest, wider access to justice, and unrivalled consumer protection being placed above those usual interests of the legal profession’s annual profits. 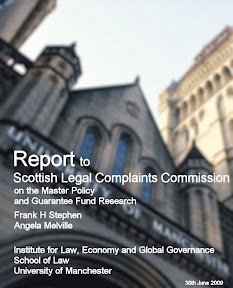 Amid the mass of problems plaguing the beleaguered Scottish Legal Complaints Commission, it has been revealed through documents the SLCC's Board members appointed by Justice Secretary Kenny MacAskill threatened to resign en mass unless the Government provided Indemnity Insurance which the Justice Secretary had staggeringly failed to include in the Commission's formation process. 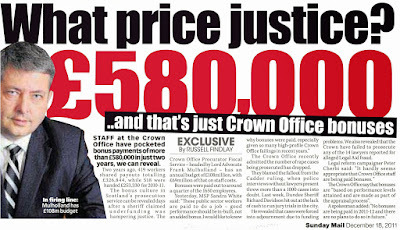 Justice Secretary's gaffe on insurance against threatening crooked lawyers : Mr MacAskill's appointees to the Commission, a collection of ex Police officers, ex (or serving) public service employees and lawyers, felt their personal assets may be put in danger during the course of their 'duties' in considering complaints against crooked lawyers and other sinister elements of Scotland's notoriously corrupt legal profession. The much coveted Indemnity Insurance sought by the SLCC's board members relates to their own fears over being sued in the courts by both crooked lawyers and clients who feel their decisions in complaints have either misrepresented issues or not been effective in resolving the difficulties caused by lawyers, or (laughably) relate to handing down too strong penalties against rogue lawyers in respect of their poor service to clients. 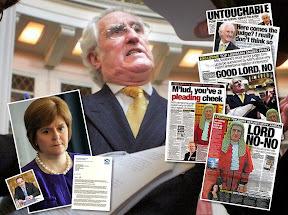 One leading solicitor last night condemned the shambles surrounding the Complaints Commission, claiming “This Commission was forced on us by the Scottish Government and Parliament.It is for them to pick up the bill and give both the public and the legal profession the regulation which everyone wants”. 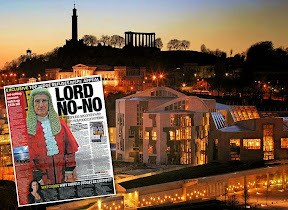 Thus, the Scottish Government will not be injecting any extra public funds solely for the purpose of the indemnity insurance craved by the SLCC’s Board members, leaving the Commission to fend for itself and try to find the extra money to cover its official’s backs in the event lawyers and clients join forces to sue the SLCC. 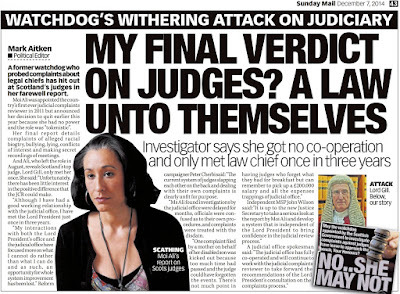 As I have reported in the past, Indemnity Insurance for lawyers in Scotland (otherwise known as the Master Insurance Policy) is a very corrupt insurance framework, to say the least, and is nothing more than a policy for protection of rogue lawyers against the clients they ruin. 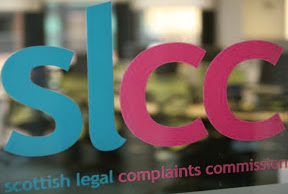 However, the problems at the Scottish Legal Complaints Commission only get worse, as further revelations show the Law Society of Scotland is failing in its duty to collect and hand over the annual levies of around £300 from each solicitor in Scotland, which are required to keep the SLCC going. 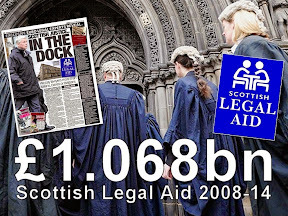 If the levies are not collected, public funding will have to be injected yet again by the Scottish Government to keep the Commission functioning, while methods of recovery, which laughably include legal action against the Law Society and its members for failing to pay up, will have to be considered ! 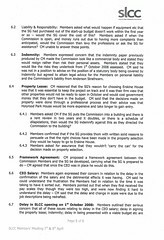 Document on Levies Jane Irvine, the SLCC's Chairman, reported during a meeting the following : “Jane Irvine informed members that the Law Society of Scotland had reported difficulties collecting all levies. Members agreed that they should check with Ministers what the chargeable interest rate would be and suggest that it might be 3% or 4% above base rate and that this might be non-changeable once set. This will be raised as part of Framework agreement discussions." 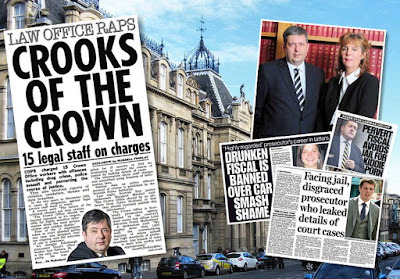 However, the Scottish Government today announced it would not intervene in the problems of the Law Society’s failure to collect the operating levies, and oddly denied Ministers even knew about the matter, an assertion which the SLCC’s own memos contradict. 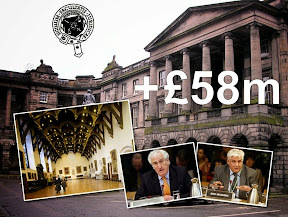 The Commission's board members now feel so unsafe in their positions due to the inadequate funding arrangements, they are now demanding a staggering additional £700,000 of public funds from the Scottish Government to continue functioning at present due to the amateurish arrangements by the Justice Secretary's Department, which have left Commission staff having to be engaged in continuing work from the previous Scottish Legal Services Ombudsman office while performing their new duties at the SLCC at the same time.